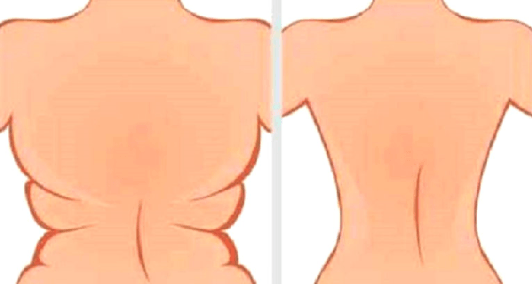 Due to the unpleasant appearance, every woman feels uncomfortable by the occurrence of underarm flab and back bulge. It can cause a discomfort when wearing a bra and as many women can testify, even losing weight and controlled diet won’t help you get rid of this nuance. However, here are 4 exercises that will give you fast results; these 4 exercises can help you to get rid of it in 3 weeks! They can be done at the comfort of your home, either utilizing a band with handles, elastic banding, tubing, hand weights or simply moving your hands just. If you do these effective exercises on a daily basis, you will solve this issue in three weeks! These exercises are a complete winner against underarm flab and back bulge. Don’t wait and sit there- instead, start now and see the results for yourself! Stand with your feet shoulder apart, extend your arms beside your body and lift them over your head. It is advisable to use hand weights or a band. With your extended arms on the sides, palms facing forward, lift them at shoulder level and then over your head. Return to shoulder level position and repeat 3 series of about 6 repetitions each. Stand with your feet shoulder-width apart and bend forward at ninety degrees, using both hands at once moving them with the dumbbells in a circular movement. First you go left, up and in towards your midsection then over to right and down. Repeat 3 series of ten repetitions. Stand with the legs separated at shoulder width and slightly twisted at the knees for firmness. Twist forward at the waist at approximately 90 degrees, with your face down, looking at the floor. Hold the hand weights in both hands bowed at the elbow and remember that the palms need to be faced towards one another. Thus, raise your hands to shoulder level or near shoulder level. Do a series of 3 repetitions 10 times. Extend your arms at the sides at shoulder height with palms facing up. Bend your elbows from this position to ninety degrees upwards. Bring your arms to the front in this position until your lower arms touch at the sides. Return to starting position. Repeat 10 sets of three repetitions. Note that you must be persistent and patient, since the results will not be visible overnight. You must be organized and disciplined, and do these exercises on a regular basis in order to achieve your goals and get the perfect back and underarms.